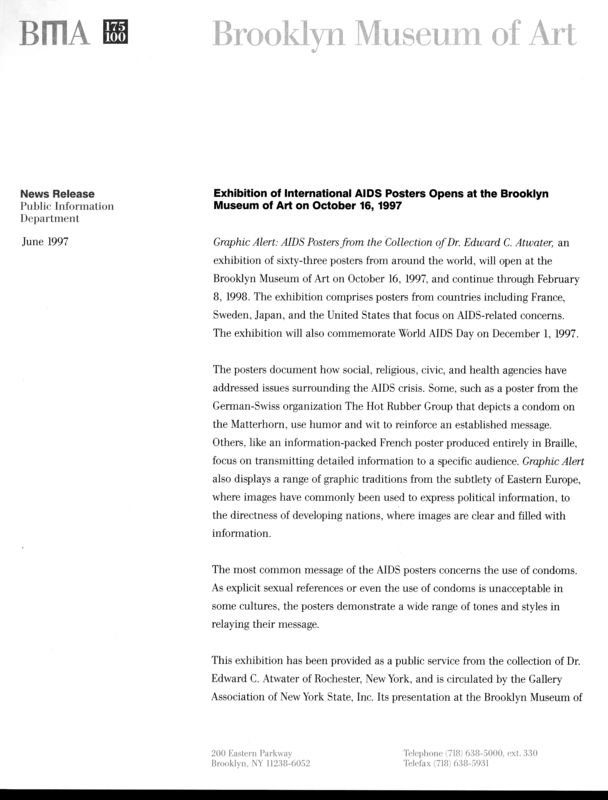 June 1, 1997 Graphic Alert: AIDS Posters from the Collection of Dr. Edward C. Atwater, an exhibition of sixty-three posters from around the world, will open at the Brooklyn Museum of Art on October 16, 1997, and continue through February 8, 1998. The exhibition comprises posters from countries including France, Sweden, Japan, and the United States that focus on AIDS-related concerns. The exhibition will also commemorate World AIDS Day on December 1, 1997. The posters document how social, religious, civic, and health agencies have addressed issues surrounding the AIDS crisis. Some, such as a poster from the German-Swiss organization The Hot Rubber Group that depicts a condom on the Matterhorn, use humor and wit to reinforce an established message. Others, like an information-packed French poster produced entirely in Braille, focus on transmitting detailed information to a specific audience. Graphic Alert also displays a range of graphic traditions from the subtlety of Eastern Europe, where images have commonly been used to express political information, to the directness of developing nations, where images are clear and filled with information. The most common message of the AIDS posters concerns the use of condoms. As explicit sexual references or even the use of condoms is unacceptable in some cultures, the posters demonstrate a wide range of tones and styles in relaying their message. This exhibition has been provided as a public service from the collection of Dr. Edward C. Atwater of Rochester, New York, and is circulated by the Gallery Association of New York State, Inc. Its presentation at the Brooklyn Museum of Art has been organized by Marilyn Kushner, Curator of Prints and Drawings. Brooklyn Museum Archives. Records of the Department of Public Information. Press releases, 1995 - 2003. 1997, 121-122.